Does Itching Disturb Your Regular Activities? 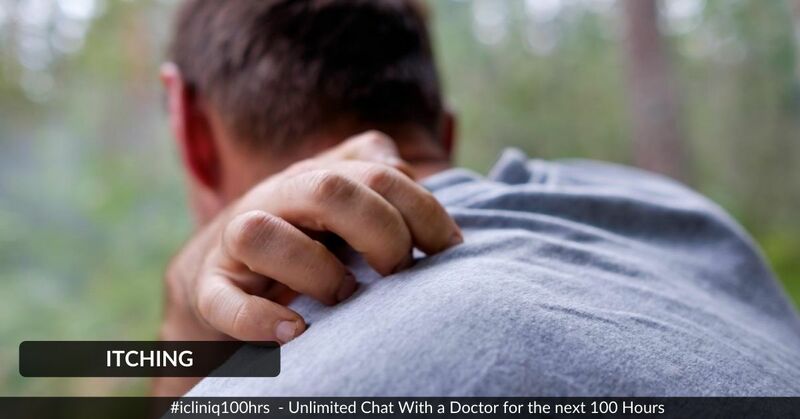 iCliniq › Ask a doctor online › Health Articles › Urticaria › Does Itching Disturb Your Regular Activities? Written by Dr. Vidhi Hareshbhai Talati and medically reviewed by iCliniq medical review team. Nowadays itching is a major problem or symptom of most of the allergic, systemic or fungal diseases. 4 out of 10 people have had some type of itching problem of the skin in their routine life. Severe itch also disturbs regular activities of daily living of mankind. Itching is defined as some type of unpleasant sensation that increases the desire to scratch to relieve the feeling. It is also referred as pruritus or urticaria. If itching is present for more than 6 weeks, it will be considered as severe or chronic and needs careful evaluation and treatment. At times itching is beneficial because, skin triggers itch and serves as a protection for our body in order to remove foreign particles from skin. But this will be for few seconds only. People of any age can be affected. Children are less affected than adults. Please suggest homeopathy medicine for urticaria. I have severe itching in the groin area. What should I do? My wife has urticaria. Please help. There are many factors that trigger itching. Itching may be localized or generalized. Many physical, external and internal stimuli activate itching receptors and produce severe itch. Receptor for activation of itching is free nerve endings of nonmyelinated C- type nerve fibers that are located in superficial layer of skin (epidermis). Patients with severe itching are highly sensible to histamine and serve as internal stimuli. Other responsible receptors for severe itching are G protein receptors, histamine H4 receptor; brain derived neurotrophic factor and neurotrophins nerve growth factor. Keratinocytes provide immunity against severe itching. It provides protection against physical, environmental and chemical stimuli. It produces itching in the skin by means of removal of foreign particles from the skin by scratching. Further more, sensory nerves along with epidermal keratinocytes in the skin, also enhances itching function. When keratinocytes are activated, it will release inflammatory and pruritic substances. Keratinocytes have both functions, activation and inhibition of itch. Most common mast cell mediator responsible for itching is histamine. Mast cells contain large numbers of histamine. When mast cells are activated, it will release histamine in surrounding area and activates H1, H3, H4 receptors. Blockage of these receptors causes reduction in itching and inflammation. Mast cells of psoriasis contain interleukin-31, which is a potent pruritogenic substance. Cells that activate mast cells in pruritic diseases are neutrophils such as NT-3. In chronic skin diseases, there is presence of increased cellular infiltration of eosinophils. They are found in the vicinity of nerves. Various neuropeptides and other cytokines cause activation of eosinophil for itching. Different diseases are such as inflammatory skin diseases, metabolic diseases, liver and kidney diseases, lymphoproliferative diseases and myeloproliferative diseases are the cause for severe itching. History - evaluation of underlying disease, time of onset, severity of itching, duration of itching. Itching history - aggravating factor, relieving factor, severity scale. Associated factors - lymph node enlargement, tumour, chronic skin diseases, fungal infection, ringworm infection, urticaria etc. Skin examination - size of patch, affected area, depth of patch, shape of patch, presence of scaling border. Sign of itching - dryness of skin, pigmentary changes of skin, skin color changes, redness, swelling of skin etc. On palpation - warmth on palpation. Associated sensations - burning, irritation, dull ache. Other clinical procedure to evaluate skin diseases are skin biopsy, skin allergy test, blood test, urine analysis, CT scan and brain MRI (for detection of tumour). The affected area should be washed with antiseptic solution followed by application of moisturizing lotion to eliminate dry skin. During summer, increased fungus growth causes severe itching due to perspiration, so skin should be clean to eliminate this problem. Some internal or external stimuli should be avoided such as cold weather. Application of antifungal dusting powder such as Clotrimazole over affected area gives beneficial effect. It should be applied after bathing, swimming etc. Inner wear should be changed every day or twice a day. Loose fitting clothes preferably cotton clothes eliminate perspiration problem which aggravate severe itching. Diabetes is a leading problem of severe itching due to low immunity and it will increase the chances of fungal infection. Hence glucose level must be within normal limits. Exchange of clothes with others should be avoided. It will increase the chance of ringworm infection. Sweating or perspiration should be prevented as much as possible. And it is achieved by application of antiperspirant skin friendly deodorant. Nowadays, some washes are available for treatment of severe itching in the genital area of female. It maintains normal balance of pH. Walking with bare foot also aggravates itching problem. So, wearing sandals is beneficial. Blood or other laboratory investigations should be evaluated because some sexually transmitted diseases will aggravate severe itching. Treatment should be established for the underlying cause for severe itching. Temporary relief should be achieved by polidocanol or menthol as it gives soothing and cooling effect over the affected part. Application of topical corticosteroids and different emollients will help to eliminate itching problem. Supportive therapy for sleep disturbances, antidepressants and sedatives are given and for chronic erosive scratching, local administration of corticosteroid is done. Treatment of atopic dermatitis, chronic eczema and genital fungal infection with calcineurin inhibitor and topical cannabinoid. Primary treatment for chronic pruritus and chronic urticaria are nonsedating H1 antihistamines, as it decreases degranulation and release of pruritogenic mediators by mast cells and increases antipruritic effect. Use of lubricants such as oil, humectants like urea. Use of cooling agent menthol and camphor for topical application. Aim of systemic approach is targeting on the central nervous system to eliminate itching. Treatment with anticonvulsants such as gabapentin and pregabalin are also available for chronic itch. Antipruritic drug such as agonist (Naltrexone) or antagonist of opioid system will act centrally and gives relief. Severe itching in refractory hemodialysis patients have to use k-receptor agonist Nalfurafine. Selective serotonin reuptake inhibitors (SSRIs) Paroxetine and Sertraline are useful in severe itching in patients with polycythemia vera, somatoform pruritus, paraneoplastic pruritus, and cholestatic pruritus. Idiopathic pruritus, cholestasis, uremia and neoplasm-induced pruritus are treated with Mirtazapine. In severe cases of pruritus, tricyclic antidepressants like Doxepin are used. Use of antifungal agents in the treatment of fungal infections are Amphotericin B, Ketoconazole, Miconazole, Fluconazole, Voriconazole, Itraconazole, Posaconazole, Echinocandins such asCaspofungin, Anidulafungin, and Micafungin. Use of Griseofulvin for ringworm infection. Use of Terbinafine for onychomycosis (fungal infection of the nail) and for ringworm infection. Other topical or systemic therapy that gives permanent relief from itching includes treatment with Capsaicin, Calcineurin inhibitor, UV therapy, immunotherapy, immunosuppressive therapy etc. Do you have a question on Urticaria or Itching? Why am I having severe itching beneath the belly and between thighs?